Companies that have made the effort to adopt green procurement practices know eco-friendly supply chain techniques can't simply be implemented in isolation. Rather, in order to be as effective as possible, sustainability needs to be made an integral part of the firm's larger business strategy. The logic behind this principle is clear. The distribution supply chain is a large network made up of a variety of different types of companies with their own unique sets of operational practices - not to mention their own, smaller supplier networks. If sustainable initiatives are implemented without a guiding policy to support them, it's almost inevitably that they'll fall by the wayside. So, how can companies build sustainability into their business strategies in an integral, articulated way? For many firms, the first step may be to introduce some clarity into discussions surrounding sustainable product sourcing. Sandra Rapacioli of the Chartered Institute of Management Accountants recently spoke to The Guardian regarding the need for each firm to develop a clear definition of sustainability in relation to its own operations. 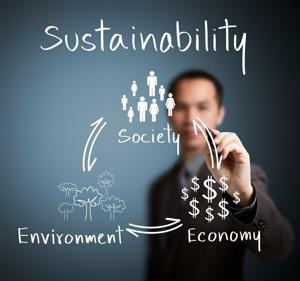 "Sustainability can mean different things to different people … so it is important to be clear about what it means to your company," Rapacioli told the news source. If the company can outline exactly what green logistics means within the context of its own business needs, it should become much easier to relate the goal of reducing environmental impact to broader strategic aims. But once that definition is clearly articulated, the dialog regarding sustainability can't simply be put aside. In a column for GreenBiz, business expert Cora Lee Mooney suggested that executives in charge of corporate reporting should create a value chain map so that sustainable initiatives can be placed in relation to broader concerns. "Often, the mapping process will open up channels of communication with corporate strategy, business continuity and risk assessment teams who may have independently developed value chain maps of their own," Mooney wrote. One of the issues implicit in Mooney's statement is the need for firms to be proactive about how they integrate sustainable sourcing with their efforts to reduce business costs. The Guardian noted the relationship between green practices and streamlined operations is often quite direct. "Sustainable businesses tend to be more efficient businesses; making the link clear can help people grasp tangible benefits such as lower fuel bills and reduced wastage," the source pointed out. Companies that give eco-friendly procurement and manufacturing practices a central role in their strategies may find themselves more agile - and better looked upon by consumers - than the competition.